Cremation: Gathering to celebrate life. We are very proud (and families have peace of mind) that when a member of your family dies and is brought into our care, they will stay under our care in our Cremation Care Center until the cremation is complete. This is just the right thing to do. Funeral homes that do not have their own crematory are forced to use a 3rd party crematory, often traveling 45 minutes away or more with your loved one. We don’t think that is very dignified at all, so we don’t do it! When comparing funeral homes, ask for a tour of their cremation facility (if they have one) and decide for yourself if that is where you want your loved one to be. Not only were we the first area funeral home to own a crematory, but we recently added an addition to our building to encompass all aspects of cremation services. Perhaps you want to spend time with your loved one and be present when the cremation takes place. This is becoming more and more popular. We find it helps bring closure. Our care center is able to accommodate all religious rituals and customs that may be important to a family. We encourage anyone to come by for a tour of our crematory and the care center. We are very transparent and want to educate the community. Give us a call and we will be happy to set up an appointment. Our facilities are known to have a ‘home like’ feel to them. We receive many wonderful comments about how comfortable our funeral homes are and the amenities they offer. Perhaps you would like our professional staff to help you plan a fitting celebration of life service for your loved one and use our historic space to visit with your guests. Whatever your wishes, whatever the venue, our cremation services are as unique and varied as the life we are honoring. Call us for a tour of our beautiful funeral homes and let us show you the many ways we are celebrating lives. We think it is important that you know you have many options when it comes to selecting cremation. Whatever your wishes are, all of us at Malcore Funeral Homes are honored to walk alongside you and your family during a difficult time. Our Cremation Care Center is located at Malcore (East) Funeral Home. Give us a call for a tour. We’ll be happy to show you around! 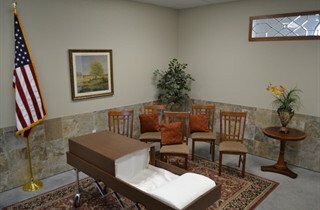 The photo below is taken in our Cremation Care Center prior to a family gathering to say goodbye to their loved one and witnessing the start of the cremation.